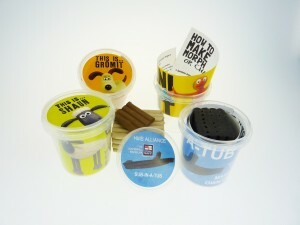 The process for making Custom Modelling Clay Kits is quick & easy! There are three different types of Clay – standard (similar to Plasticine) does not dry, is re-usable, but is firm enough too hold its shape indefinitely. Air drying clay, this is extremely lightweight and versatile, once dry is rigid & can be coloured by paint or felt tip pens. Lastly a heat cured clay, once shaped & cured this provides a permanent waterproof product. Your custom, UK-made Modelling Clay Kits are thoroughly QC checked at each stage of production & assembly then carefully packed, ready for dispatch. Approximately 4 weeks (handsample 5 days, production 20 days & delivery (UK) 3 days. What Custom Modelling Clay options do you have? Characters, mascots, logos, vessels, most shapes can be made from UK Modelling Clay, colours of which can be Pantone matched if required. Our Kits & Mini-Kits in tubs include fun & easy to follow instructions, these & any other packaging options are easily branded. What’s the minimum order quantity for Custom Modelling Clay Kit? Generally the minimum viable quantity is 500. What will a Custom Modelling Clay Kit cost?